Livigno is expanding: as of last week the Italian bike resort has three new trails on its extensive bike map. 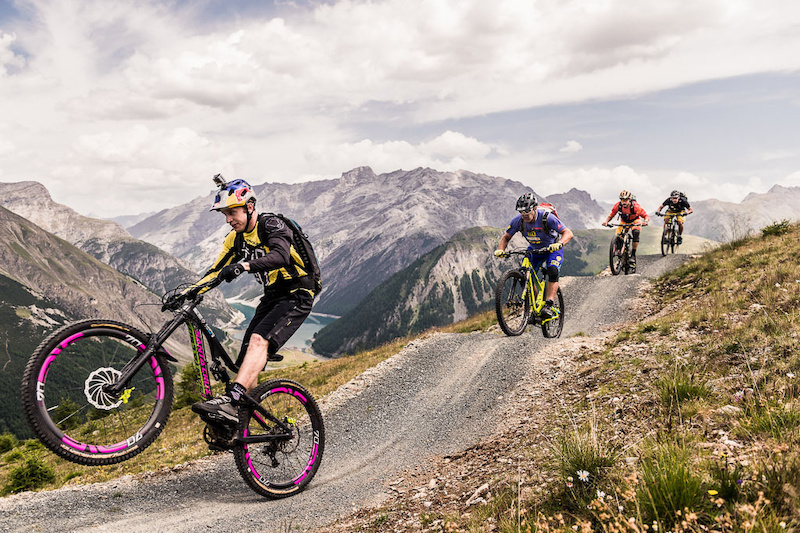 Last week, a new route was opened in Val Minor, an important link between Livigno and Switzerland, and on Saturday, Livigno’s long-term supporter Hans Rey and friend, Danny MacAskill took the chance to test the two new flow trails located on the Carosello 3000 mountain. Up and over; the new mountain pass from Livigno to Switzerland is 5.8 km/ 3.1 miles long and starts at the top of the Forcola Pass on the Swiss-Italian border. Riders can enjoy a last refreshment at the mountain hut before taking on the new trail with its 180 m/ 590ft climb which takes about 50 minutes to reach the famous Ospizio Bernina station. Livigno and the two Swiss municipalities Poschiavo and Pontresina have successfully added a new mountain pass to the old demanding trails which took up to four hours to complete. This magical route is surrounded by untouched nature and stunning views of the glacier Vadret da Palu and its lake. Having tested the new connecting trail with a bunch of bikers earlier in the week, Hans Rey took part in the official opening of the flow country trail at Carosello 3000 with non other than friend and fellow trials rider, Danny MacAskill. It is the first time Danny has come back to Livigno since 2012 when he last rode here with Hans Rey. Together, the two biking icons took laps on the new 'Coast to Coast' (6 km/ 3.7 mi) and 'Rollercoaster' (4 km/ 2.5 mi) trails. 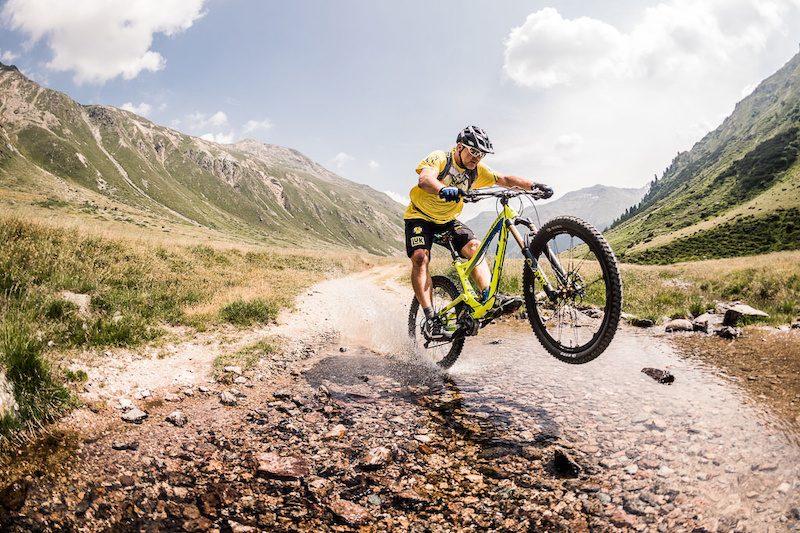 Their fine-tuned sequence of rhythmic jumps and berms give cyclists the feeling of ultimate flow and enjoyment. In cooperation with Hans Rey and the flow country expert Diddie Schneider, the local Alberto Clement and his crew have shaped a route that is ideal for both beginners and advanced riders. At the opening day, invited guests were impressed by the fun factor and readiness of the trails. "We worked hard but I'm really happy about the way Carosello 3000 have built the trails”, says Hans Rey. “You can recognise it’s real flow country because you look at the people’s face and they are smiling when they arrive at the bottom. We already have 10 km and it’s just the beginning. Livigno is one of the best places in the world for mountain biking and now we have all kind of trails." Danny MacAskill also liked the two new trails: "For me it’s always awesome to be here in Livigno. I rode already with Hans all over the valley and now riding the flow country trails as a pro rider I had the same enjoyment. I hope to be back again soon." The flow trail project is far from over: further sections are in the planning. Another 4 km/ 2.5 mi trail will be already completed in mid-August. 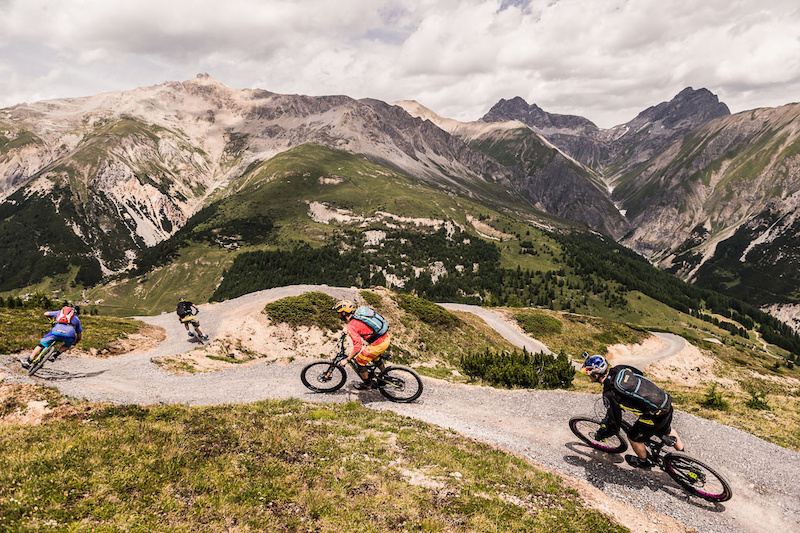 Eager bikers should not waste any time coming to Livigno: the first event on the new trail takes place on August 2nd. 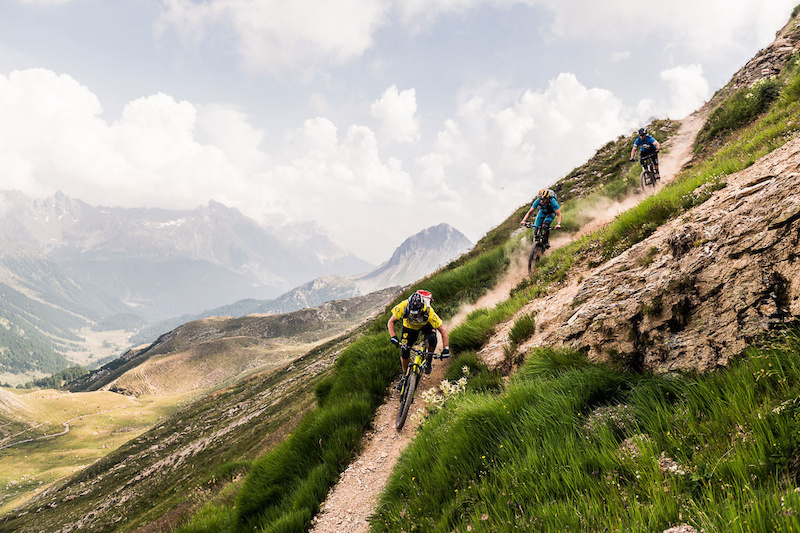 As part of the Adventure Awards Festival (July 27th – August 2nd), the 3K Up & Down race is presented by the Adventure Awards, Carosello 3000 and Crankbrothers. The principle is simple: 1 Pro-Rider, 100 participants, 2 lifts, a 13 km/ 8 mi long trail and 7 hours to ride as much as possible. How many times can you take the lift up and bike down in 7 hours? So gear up and we look forward to seeing you in Livigno! To find out more about what Livigno can offer please visit: www.livigno.eu or www.facebook.com/LivignoFeelTheAlps . yeah but you know, at the end of it all your still riding bikes, plus I bet there is lots of more challenging stuff right next to that. Maybe you can show us how to do a backwards nose wheelie! Came here to say "BORING" but was beat by 6 hours. Sometimes hard to be timely on this site. Any site for that matter. boring is what I thought "flow trails" would be. But Bischofsmais, Petzen, Saalbach etc convinced me of just the opposite; flicking your bike around effortlessly without burning hands and smoking front brakes actually isn't that bad. Even in Schladming we found ourselves riding the Flowline more often than the WC Downhill. @MatthewCarpenter: I'm sure the trail must be fun to ride, but the video was indeed very boring to watch. Terrible music, boring shots, no real action, and many people in a row who all not clear the jumps. WTF is going on with PB comments? People comment on an article and it appears on different ones as well, they're all over the place! @Boardlife69 sorry man, its just that people rag on so-called "enduro" all the time and how its "ruined the sport". it becomes hard to distinguish between sarcasm and seriousness, esp on the internet. This is hilarious. Its replacing whatever you type with someone elses comment. Fun stuff. Old(er) legendary & new(er) legendary. If I can ride it with Hans & D-Mac then maybe we can work out a deal. There were a few rocky points on the trail, but no garden. The rock gardens are still being put together. Jumanji is a steep downhill with techinal sections, gaps and jumps. Same here. I bought a Trek 830 Antelope at a shop in 1991 for about $450 IIRC. Rode it a few years and decided to upgrade to a bike with suspension. In late 1994 I bought a '93 Stumpy S-Works that was quite similar to Ned's bike: Future Shock on a black cherry M2 frame. I found the listing for the bike on a Usenet group. The seller MAILED me color photos - and I blindly mailed him a thousand dollars back. Talk about old school - no digital pics, no PayPal. The bike showed up without a hitch. M900 XTR cranks and hubs, Syncros post, World Class ti BB, X-Ray shifters, Flite Ti saddle, and those 737 pedals. That was a fun bike. I have a gallery of bikes I have owned on my profile page. You can find a pic of the S-Works there. I added the Rock Ring you see in the pic. And yeah, paint chipped easily off that frame as Ned says. There were a few rocky points on the trail, but no garden. The rock gardens are still being put together. Jumanji is a steep downhill with technical sections, gaps and jumps. Proud of riding with those two guys that day! where have all the good trails gone-only fireroads dangerous for life-you get bored to death by riding it! filmed on a Gopro 1? Danny been dropped by POC and replaced with Endura? I am not buying a bike based on etched bolts. Just saying. I did not make this comment. WTF?